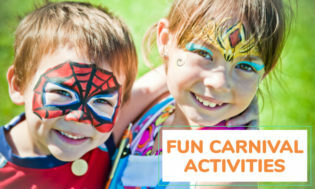 Need some fun circa games and activities for your big event? Look no further. 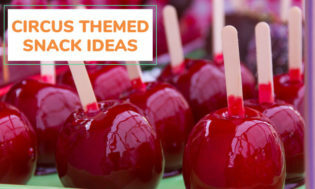 Here you will find an immense amount of circus themed ideas to make your event a success. 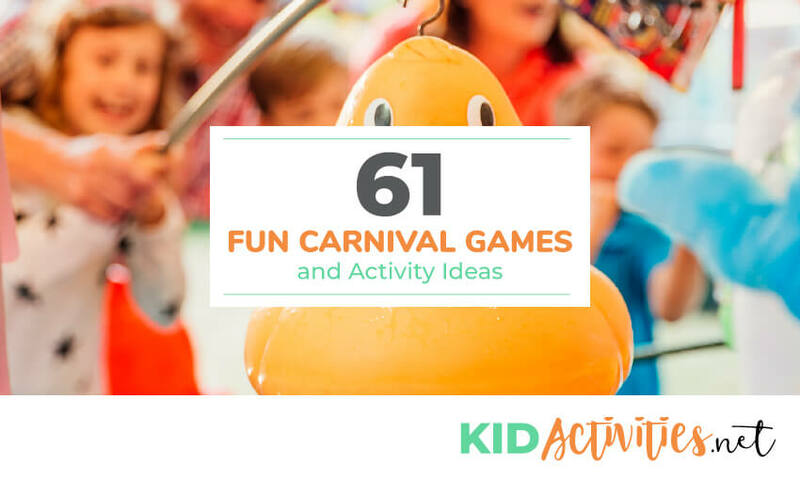 Circus games, music, carnival food ideas, and much much more. 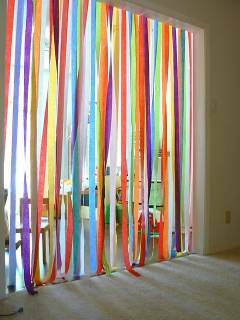 Make lots of colorful PAPER CHAINS to hang and swag from the ceiling and windows! GET AN INSIDE CIRCUS TENT FEEL! If your party is in a room with a normal height ceiling, secure bed sheets to the ceiling at each corner of the room. Let the middle drop slightly as you swag them towards the room center. 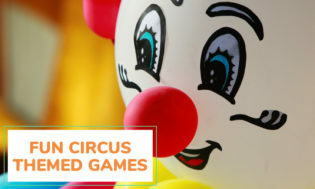 Hang pictures and posters of clowns, circus performers, cartoon and circus animals and cut-outs of food such as popcorn, ice-cream and cotton candy. You can make circus posters using pages from any circus coloring book. Enlarge the pages at an office supply store, and then color them with craft paint or watercolor crayons; these cover large areas easily. 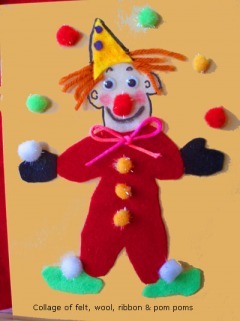 Also create circus signs with craft paint and poster board. Include wording such as: “Welcome to the Greatest Show on Earth!”, “Under the Big Top!”, or “AMAZING!” Hang the posters on the walls throughout the circus space. To make one, use a nail to poke a hole in the center of a plastic coffee can lid. With a marker, draw a spiral that starts 3/8 inch from the hole (it keeps going around itself in circular pattern) and gradually extends to the rim—then cut along the line with scissors. Knot an end of a piece of string, thread the other end up through the hole in the center, and the twirler is ready to hang up and spin. Make a TICKET BOOTH This can be done using a large cardboard box; use paint or markers to decorate the booth. Be sure to play circus/carnival music–especially as the event starts! Start out with it louder and subdue to background music as time progresses. Play songs such as: Be a Clown, That’s Entertainment, No Business like Show Business, Thunder and Blazes or Entry of the Gladiators. Some polkas and marches also work. 1. Paint the bottom of a large cardboard box (with low sides) blue. The blue is the water. 2. Put some small green paper plates on the ‘water’. These are lily pads. 3. Purchase small toy frogs and have children toss the frogs onto the ‘lily-pads’. Optional: Put numbers on the pads and add the points up as the frogs land on the pads. It’s best to play on a grassy area or even a sandy beach. Cut rags in wide strips – 3 feet long. Use old stockings; they are softer and have some give to them. Pair up into partners and stand side by side. Tie one persons left leg to the other player’s right, or vise versa. Practice walking together until you get a rhythm going and then try hopping or running. This can be played as a race or just for active fun. An obstacle course can be created as well. For a real challenge if it is warm -try adding and avoiding an oscillating sprinkler. Be sure to wear swim suits! The kids won’t be able to make it without getting wet! Divide players into equal teams. For each team have a box containing a complete costume, each costume should have the same number of pieces (4 or 5 is fun – Shirt pants, big shoes, huge tie, clown nose, wig or mask, etc. )Anything silly that a clown might wear! In turn each player must put on the costume and run to a certain point where they take the costumes off and put them back in the box. They run back to start where the next player repeats the process until one team finishes and wins. Do you have a balance beam? If not-using bright colors paint a 2″x4″ piece of lumber. Once dry you have your Tight Rope! Children can pretend placing one foot in front of the other. Add some fun with props. Can they juglle bean bags while walking or balance a book on their heads?! 1. Give each player one of three names associated with hot dogs-such as: hot dog, relish, mustard. 2. To start play-call out one ‘hot dog’ word. All players with that name run around the parachute. 3. Call Mushroom (see PARACHUTE GAMES for more info–it’s the act of filling parachute with air) and also an action such as skip or shake hands. 4. Players run under the parachute performing the called out action–while returning to their places. Turn the body so that the chute is held with only one hand. Walk, hop, jump, or skip around holding the chute. It looks like a merry-go-round! 1. With the parachute lowered, players raise their arms (and the chute) as high as possible. 2. Once the chute is high, on a signal-all take 3-4 big steps towards the center. Big Top grows before our eyes. Lift the canvas off the ground. – All it takes are two big bowls of popcorn and some small cups per team. Have kids run and get a cupful of popcorn and transfer it to the bowl across the room. The first team finished wins. Because of potential popcorn mess, this would be good played outside! Click here for KidActivities great POPCORN THEME. Popcorn and a circus or carnival go together! Players walk in a circle of numbered squares while music plays. When the music stops, the facilitator chooses the winning numbers from a hat. Players standing on a winning number get a prize. TIP: Check with local codes if home-made goods can be used, otherwise use prizes like Hostess Cupcakes, Twinkies, Fruit Pies, or packaged cookies. Often local grocery stores will donate goods, or check with local fast-food outlets for gift certificates for ice cream cones, cookies, etc. 1. Create a beanbag toss game by using a large sheet of foam board. 2. Decorate it as desired and cut some circles out that are large enough for bean bags to go through. 3. Support the board by propping something behind it. It could also be propped by taping a hula-hoop to the back-side top and stretching it out at the bottom to stand the board game. 4. Purchase bean bags or make your own from fabric and dried beans. Also see how to make paper napkin beanbags…(In relay games at page bottom) A fun and functional craft project! This is a great activity for kids of all ages! Purchase or make bean bags suitable for tossing and draw a large picture of a clown on a piece of cardboard with its mouth wide open. Draw and cut out the mouth so you have a hole large enough to toss the bean bags through. Place the box about ten feet away (adjust distance for the age of your children) and give each child a chance to toss the bean bags into the clowns mouth! Set up a hula hoop so it stands up securely. The player tries to throw a small stuffed lion or tiger (or bean bag) through the hoop. Decorate the hoop with colored paper to look like flames. Tuck a prize slip inside a small balloon and then inflate. You can write the name of the prize on the slip or just a number corresponding to a prize. Have lots of prize balloons ready, store in plastic bags. Player chooses a balloon and “stomps” it to pop it and see what their prize will be. 15. GUMMY WORM HUNT CONTEST -This one is fun! IDEA: This can also be adapted to putting whipped cream on a small paper plate. Under the whipped cream put a few m&m’s or a maraschino cherry. The children must find the hidden goodies with their mouths. The first to eat the m&m’s or cherry is the winner! Of course, no hands used…Be sure to have your camera ready-a good photo op! To prepare, make one small bowl of Jell-O for each child (plus a few extra). Line the bowls along the ground outside if the weather permits. If playing inside, lay a tablecloth or other mess protection under the bowls for easier cleanup. To play, the kids place their hands on the ground beside their bowls and must keep them there throughout the game. When the command is given to start, all players begin eating their bowl of gelatin. The first one to clean his or her bow wins! Optional: Add a dollop of whipped cream to add a little mess! Throw a small Frisbee or bean bag at a large picture of a circus animal (lion, elephant, tiger, dog, seal, etc.) on the ground. The closest is the winner. 1. Children form a circle. One person is chosen to be the leader. 2. The leader calls the name of a child and names an animal or circus performer. 3. The child does an imitation on the movements of the animal/person named. 4. AFTER THE CHARADES, all players form a line for a “Circus Parade” led by the leader. Ring Master, Tight Rope Walker, Jester, Food vendors, Elephant, Tiger, Dog, Seal, Lion, Lion Tamer, Fire Eater, Clown, etc. Line dancing and square dancing are fun for everyone. Keep the dances as simple as possible so no one feels intimidated. If budget allows, hire a professional caller or DJ if you can’t find an experienced volunteer. Have your principal or a popular teacher dress up as a fortune teller. Decorate their office as their booth. Both the fortune teller and the kids will enjoy the ‘game’. Give fortune cookies as a treat. You can get cookies with messages specially designed for kids if you plan ahead. You could someone dress as a clown and pose with the kids and parents! Mix all ingredients together, stirring to mix well. Use a thin paintbrush to apply the tattoo. Decorate an area as the “jail” and have volunteers dress as police officers or sheriffs. A person is arrested when a “friend” pays one ticket to have them jailed. They then have to pay one ticket to get out. This game works better with older children and teens. Use your own karaoke machine or rent a professional set up. Lots of fun for both kids and parents. 1. Make RICE CAKE OR SUGAR COOKIE BALLOONS! Decorate either large or smaller sized rice cakes or round cookie with frosting. Add a licorice string. 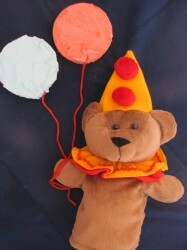 The ‘Balloons, with the clown bear are made using large rice cakes. The ‘balloon’ on the left is blue tinted frosting—the ‘balloon’ on the right is red tinted cream cheese. Place a pineapple slice on a paper plate. 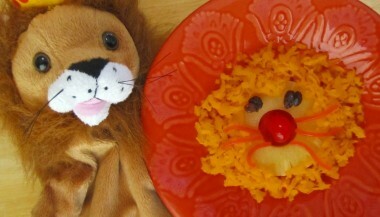 Spread shredded carrots around the pineapple for the lion’s mane. Mix animal crackers, m&m’s, raisins and popcorn. Add peanuts if there are no allergies. For the head, place a scoop of ice cream on a plate–or in a paper cupcake liner as in the drawing. For the clown’s hat, place an ice cream cone upside down at the top of the ice cream face. 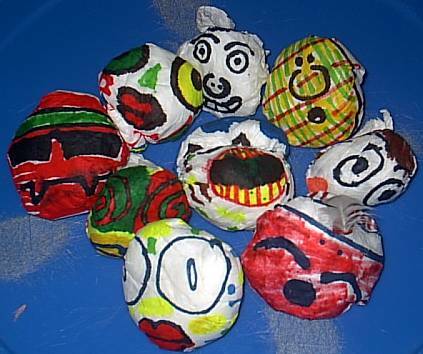 Have children decorate their clown faces with colorful m&m’s. Use red icing gel for the mouth. Slice apples into 1/4″ to 1/2″ circles. 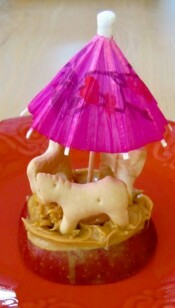 Use plain regular animal crackers. Have children color them with regular markers or paint. You can use clear nail polish and paint over what they have colored after it is dry. Then use a magnet small enough and glue it on the back with a hot gun or other strong glue.… instant magnets you can put on your fridge. NOTE: KidActivities used tempera paint to color the cookies. Clear nail polish was applied as a glaze when they were dry. ( It took about an hour for the animal crackers to dry from the paint.) One cookie/cracker was left natural with only a coating of clear nail polish… they all actually all had a ‘glass-like’ appearance. The magnetic tape– that is cut off from a roll –is what KidActivities put on the back of the magnets. Because the animal crackers are so small–be sure to get a high quality magnet. For K-A…the magnets stayed on the white board permanently–much better than the refrigerator. To make this craft project you will need animal crackers, paint, a flat backed pin, clear nail polish or varnish, and some craft glue. First paint the animal crackers. After they dry, polish or varnish in a well ventilated area and let them dry. Next glue it to a pin. 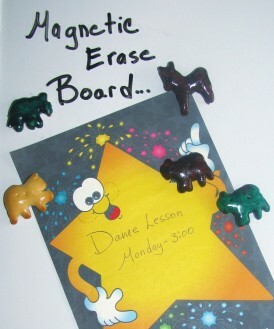 An option is to only polish/varnish the animal crackers as the one up above– in the image of the magnetic board. On paper draw, color, or paint a circus scene such as ‘Under the Big Top’ or ‘The Background for a Parade’—Glue on the animal crackers to complete the scene. Lunch Sized Paper Bags, Crayons, Paint, Markers, Stickers, etc. Put out the bags and decorating materials. Instruct the children to decorate their bags in a bright ‘circus-like’ manner and write the word ‘Popcorn’ on it. When the bags are complete–fill them with popcorn! 2. Color with oil pastels; blend primary colors to create own secondary colors. Art by a first grade student of Art teacher Michal Austin. 1. Begin by drawing clowns on tagboard with a sharpie. 2. Glue on wiggle eyes and pom pom. 4. Cut out. Draw patterns on the black paper with oil pastels. 5. Attach clowns to black paper…Art by a Grade 2 students of At teacher Michal Austin. Large sheets of paper (roll paper), markers, crayons, decorations as desired. Form partners between the children. Have them take turns tracing each others bodies onto the paper. 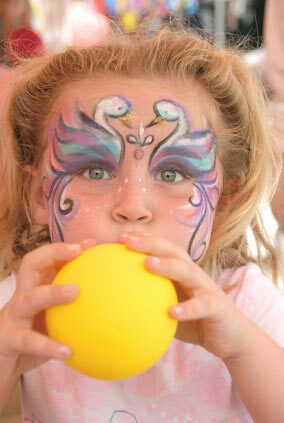 (If children are young an adult may need to trace) Children then color and decorate their tracing as a clown. Cute all lined up around the room or down a hallway! 1. Tape or glue a round piece of cardboard to each end of a paper towel tube. 2. Cut a slot for the clown’s mouth, Make it large enough for coins to go through. 3. Paint the tube white, Glue on yarn hair and features cut from the paper. The following are several games that will work for a ‘Harvest Celebration’. If you are looking for ideas to go with a Harvest Theme–there may be some ideas in the ‘Farm and Harvest Category’ that will work for you! Number and line up 5 small baskets or crates; have children stand 3 feet in front of the first crate and toss seeds into the crates in sequence. Small prizes can be given for each of the crates they get their seeds in. Give each child 4 ears of unhusked corn and race to see who can have all of their corn husked first. This is like a regular cake walk except instead of numbers, place pictures of several fall items on the floor for the children to walk on and call out the names of the items instead of numbers. Use fall themed music such as “Turkey in the Straw” or “Jimmy Cracked Corn”. Play musical chairs with bales of straw instead of chairs. A scarecrow in the center makes a fun decoration for this game. Let the kids pretend they are squirrels gathering nuts for the winter. Give each a small paper bag, then toss out several unshelled nuts onto the floor and let the kids race to see who can collect the most. Older and younger children should be separated for this game. Another way to play this game, (if you have a way to corral a large quantity of leaves) is to hide nuts beneath a large pile of leaves and give the kids a set amount of time to find as many nuts as they can. Set up a fall relay with the kids. Fill large containers with sunflower seed-bird feed. (Popcorn would also work) Have smaller, clear containers at the opposite end. Kids fill up a cup with seed and race to dump it in the empty container. They sprint back to the start and hand-off the cup to the teammates. Goal of the race is to be the first team to fill up the small container with the seeds. Try a dollar store for inexpensive clear containers. They usually stock plastic ones in apple or pumpkin shapes in the fall. Make autumn bingo cards using different types of dried seeds and beans. Check out your grocery store or natural foods co-op for plenty of unusual choices. First child to get bingo wins!